* Create spool directory for “MU-Conference”. The mu-conference component requires a spool directory to in which to store conference room information. 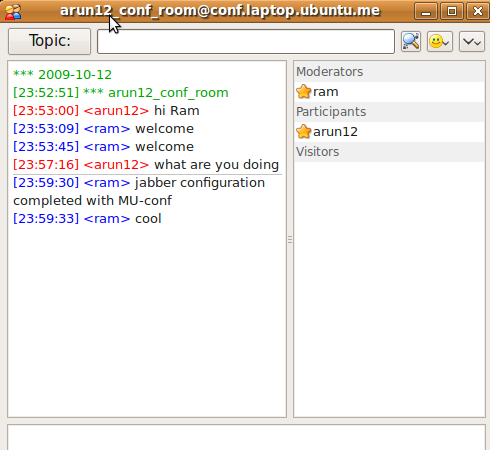 NOTE ~ “jabber:jabber” user/group name of Jabberd2 server. * Please check above article, init startup script ie ‘/etc/init.d/jabberd2’ will start mu-conference. Mon Oct 12 19:19:40 2009 main.c:168 (main): Jabber Component Runtime — 0.2.4 starting. Mon Oct 12 19:19:40 2009 main.c:219 (main): Main loop starting. Mon Oct 12 19:19:40 2009 jcr_main_stream_error.c:50 (jcr_main_new_stream): Server stream connected. Mon Oct 12 19:19:40 2009 jcr_deliver.c:51 (jcr_queue_deliver): packet delivery thread starting. * In “Pidgin” IM client, goto ‘Tools’ and then click on ‘Room List’ section. Once you detected the ‘mu-conference’ server. Please click on ‘+ Add Chat’ from ‘Buddies’ menu of pidgin. In case of PSI click on ‘Join Groupchat’ from ‘General’ menu to add “Conference/Room” and then join the ‘Confernece Room’. 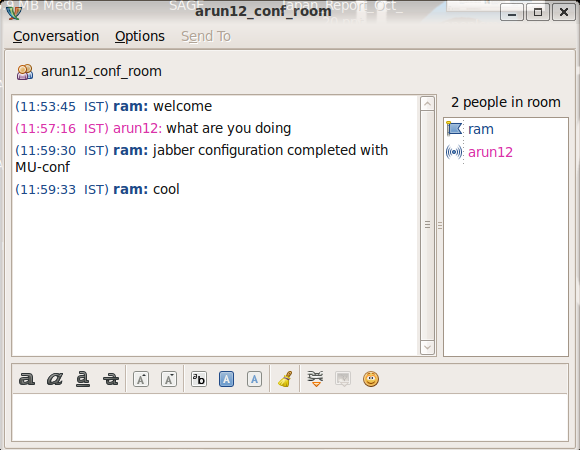 Jabberd2 is XMPP protocol based Instants Messaging (IM) server. Jabberd2 is highly scalable,high performance jabber server. The beauty of the Jabberd2 architecture lies in the fact that its component architecture distributes services across six components, each of which communicates over TCP/IP. 2) Server to Server (S2S) – component handles communications with external servers. S2S passes packets between other components and external servers, and it performs dial-back to authenticate remote Jabber servers. 3) Resolver – acts in support of the S2S component. It resolves hostnames for S2S as part of dialback authentication. 5) Client to Server (C2S) – component handles communication with Jabber clients like connection,passing packets to SM, authenticate and register users. 6) Jabber core – logging and third party plugin communication. NOTE ~ Domain Name not necessary to be hostname of server. But it should be resolvable (DNS) to one of the IP of server. * Make sure that database “Jabberd2” doesn’t exist (if exist either drop db or change DB name in db-setup.mysql file). If not export MySQL DB dump from Jabberd2 source….. NOTE ~ It is not enough to add users to the ‘authreg’ table because this only introduces users to the c2s component, but not to the sm component. Correct entries are required in the ‘active’ table as well. It is best to use a Jabber client to register users. Let’s configure jabberd2 for SSL/TLS connection. Jabberd2 is designed to provide for SSL/TLS connections not only between Jabber clients and the server, but also between the Jabberd server components (sm, s2s and c2s) and the Jabberd router. A single SSL certificate may be used for these two functions (Jabber client to Jabberd and Jabberd component to router), or two separate keys may be used.